One of the best locations in Kailua-Kona, the oceanfront community of Keauhou Kona Surf & Racquet Club is one of the area’s most popular communities for full-time and part-time residents as well as vacation rentals. Panoramic ocean and coastline views are enjoyed from the covered lanai – a comfortable outdoor living space. Island life at its best! This ground level unit has been beautifully renovated and offers the convenience of “stairs-free” living. Enjoy unobstructed ocean and coastline views from the great room and spacious covered lanai. This successful vacation rental is located just steps to the sunset lookout point. Fully renovated kitchen with new appliances, cabinets and ceiling fan. Beautifully appointed the unit is offered fully furnished with some brand new items. Tasteful renovations include new granite counter tops, wood cabinets and appliances in the kitchen, as well as new ceiling fans, and sliding glass doors from the living room and master bedroom onto the lanai. It will make a great primary or second home, and it also has been an extremely successful vacation rental. Attractive and comfortable living area with seamless access to the lanai and incredible ocean views. 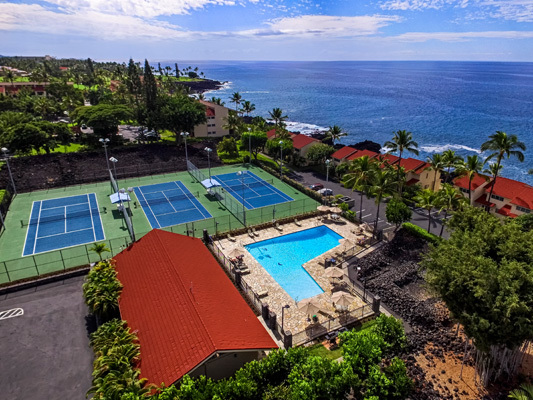 Keauhou Kona Surf & Racquet Club is known for its many wonderful amenities, including a large swimming pool, three tennis courts, volleyball court, BBQ area, gated entry and an on-site manager. The development is situated within walking distance to Kahalu‘u Beach Park (one of the island’s most popular swimming and snorkeling beaches) and the Keauhou Shopping Center with its dining, shopping, movie theaters, and services such as a Post Office, in-store banking, gas station and medical services. The fabulous Saturday Farmers Market held in the Center’s parking lot is not-to-be-missed! For more information about this property or additional Hawaii Island real estate opportunities, please contact Carrie Nicholson, R (B), BIC, Director of HL1-Big Island, (808) 896-9749 or carrie@hawaiilife.com.